On Wednesday, the slim moves in the major indices masked a very ugly breadth that saw a billion more declining volume on the NYSE, and 50% more 52-week lows versus 52-week highs on the NASDAQ. The market is clearly marking time, perhaps to see what tomorrow’s jobs report looks like or it may be getting a better handle on the tariff situation. Or conceivably, it’s to see if any sector can really do the heavy lifting that tech has provided – obviously, the answer is it will take several sectors. It was a seesaw session that saw early gains fade into the Fed announcement. In fact, there was never any real upside traction even in Technology (XLK). Apple (AAPL) did its part, but its coattails helped Mastercard (MA), PayPal (PYPL), and Visa (V) more than those Blog Tech names that have been on shaky ground. The NASDAQ-100 is still holding above its 50-day moving average, but hot money continues to flow into biotechnology, boosting Biogen, Inc (BIIB) shares to the top of Health Care. Shifting from calling the economy solid to strong is more than a frivolous decision on superlatives. The Federal Reserve is sending a clear message there will be more rate hikes this year because hikes are warranted. This was also underscored by the removal of “for now,” when discussing further gradual increases. In yesterday’s statement, it was removed simply to erase any equivocation over their intention. Initially, this didn’t help the market, but on balance, it’s really a high-end problem for investors. The Committee expects that further gradual increases in the target range for the federal funds rate will be consistent with sustained expansion of economic activity, strong labor market conditions, and inflation near the Committee's symmetric 2 percent objective over the medium term. Risks to the economic outlook appear roughly balanced. The economy is rocking. The Fed doesn’t want to upset the applecart, but they will roll out periodic speed bumps. The key, as we look to Friday’s jobs report, is how much surging wages would affect the symmetric 2% objective. Of course, I’m assuming a big jump in wages after the ADP report and other data releases, including yesterday’s Manufacturing PMI update. Late yesterday, the Trump administration raised the stakes in its battle to make China do the right thing on trade. The tariffs on $200 billion in goods could be 25% rather than their previously announced 10% tariff. The administration is using Section 301 of the U.S. Trade Act of 1974 to fight China’s unfair practice. It’s a dangerous gambit to be sure, underscored by the need to focus on minimizing the impact on U.S. consumers, firms, and workers. 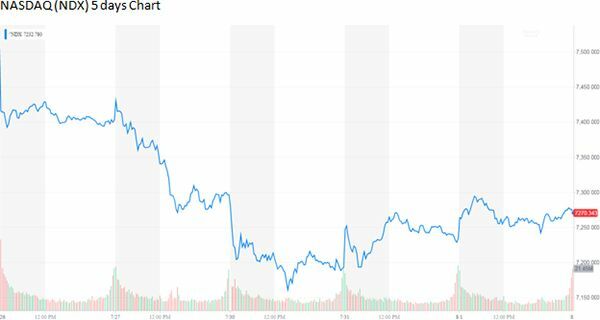 The market knew about this news even before trading began, and it didn’t stop stocks from moving higher out of the gate. The clock is ticking, and the stakes are higher, and most observers believe there will be a resolution. For the first time, America is fighting back, and we are winning the scrimmage. If we are to win the battle, I think President Trump will have to weigh key passages from The Art of the Deal with The Art of War, accepting a victory that allows China to keep their goals, but just not on the backs of our unfair relationship. "When people treat me badly or unfairly or try to take advantage of me, my general attitude, all my life, has been to fight back very hard. The risk is you'll make a bad situation worse, and I certainly don't recommend this approach to everyone. But my experience is that if you're fighting for something you believe in — even if it means alienating some people along the way — things usually work out for the best in the end." The Shanghai Composite took a 2.0% hit overnight. This morning, Blue Chip multinational names, particularly on the Dow, are going to be hit as well. This will create opportunities, but there is no urgency to buy right now. President Trump has China on the ropes. Their stock market is in deep bear territory, their economic engine has slowed dramatically, and they are facing a credit crisis. Devaluing the yuan will only prove to increase their pain in the long run. I suspect they will blink soon, while simultaneously figuring out a way to save face. Certainly, the pain is evident but hopefully short-lived, and the end result should be worth it. The quotes from Art of the Deal and Art of War are very much appreciated. Hope your granddaughter's surgery went well!